Apple is on a patent tear winning an injunction that bans sales of the Galaxy Tab 10.1 tablet in the United States. 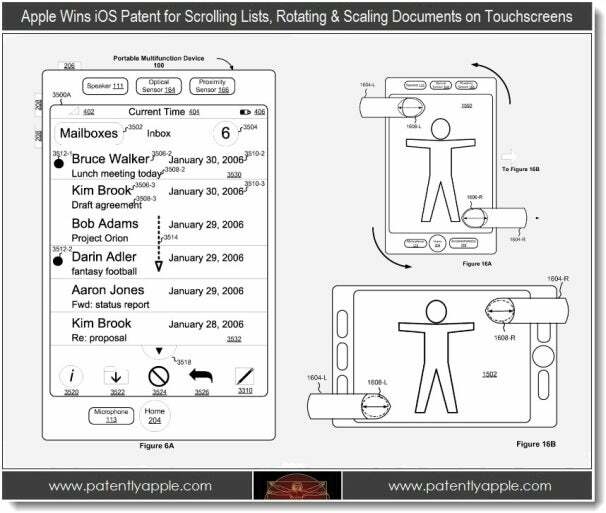 Adding to its patent victories the U.S. Patent and Trademark Office has awarded Apple 27 new patents, including a patent for scrolling, rotating, and scaling documents on touch screen devices. The patent win against Samsung is considered one of Apple's biggest wins yet. Late Tuesday a federal court in California granted Apple a preliminary injunction finding the Galaxy Tab 10.1 to be substantially similar "in the eyes of the ordinary observer" to an Apple patent (D504,889) and "virtually indistinguishable" from Apple's iPad and iPad 2. But one thing can't be disputed, Apple's win of 27 U.S. patents, including one for its famous "pinch to zoom" function, is a big win and one that could lead to more patent litigation. According to the blog Patently Apple, granted patent 8,209,606, which is credited to Bas Ording and filed in 2008, relates to "detecting a movement of an object on the touch screen display." This movement includes iOS's scrolling in the direction of finger movement (the way we're used to scrolling on touch screen devices working today, thanks to Apple), and displaying an area "beyond a terminus of the list if the terminus of the list is reached while scrolling." In other words, Apple has patented several gestures that we're pretty used to today, thanks to the prevalence of touch screen phones. These gestures include scrolling in the same direction as your finger is traveling, pinching to zoom in, and pushing to zoom out. Most touch screen devices use these gestures today, though they were new to us at one point--namely, in 2007, when the iPhone was first introduced. Along with the scrolling and rotating patent, Apple has received a patent for resizing content on a computing device, as well as patents for checking an acoustic test fixture, uninterrupted VPN connection service, adding speed effects to video, backing up and restoring user settings and data periodically, and light-sensitive displays. The light-sensitive display patent, #8,207,946, is the fifth light-sensitive display patent Apple has been granted in the last year. Apple also won a patent for an inductive charging docking station, though the company has yet to introduce such a docking station for iOS devices. These patents, particularly the patent related to scrolling, rotating, and resizing on touch screens, are a pretty big win for Apple--especially considering the numerous mobile patent lawsuits that are currently underway between Apple, Samsung, HTC, Motorola, and Nokia (just to name a few). But all the news hasn't been good for Apple. Apple also lost a battle last Wednesday, when a Dutch court ruled that the company was guilty of infringing on a UMTS-related patent owned by Samsung. Last week Apple was also dealt a patent blow when a U.S. federal judge in Illinois ruled that Apple cannot seek an injunction against Motorola Mobility in its smartphone patents lawsuit, tossing out the case "with prejudice."